This Seafood and Pesto Bowtie Pasta is equal parts simple and delicious for a quick weekday dinner. Bowtie pasta is topped with Crab Delights®, pine nuts, pesto, and cheese for rich and hearty goodness. Heat a small saucepan over medium-high heat and add pine nuts; stir occasionally to toast, being careful not to burn them, set aside. 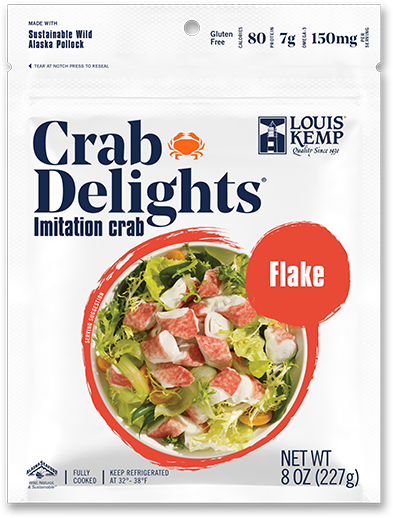 Shred 2/3 of the Crab Delights® and toss with pasta, pine nuts, 1/2 the basil and pesto sauce until evenly coated. Season with salt and pepper to taste. Add optional crushed red pepper flakes. 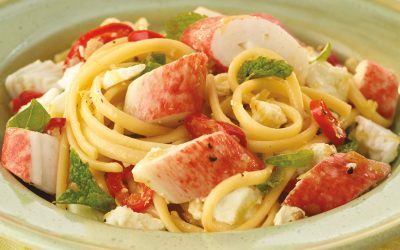 Place pasta mixture on warm plates and top with remaining basil, Crab Delights® and Parmesan cheese.